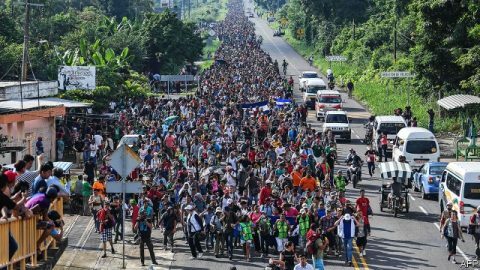 A new “caravan” of hundreds of Hondurans are heading toward the U.S.-Mexico border. A majority of American voters (55% vs. 43%) are opposed to a wall on the Mexican border, and reject every argument for the Wall. An even larger majority (63% vs. 30%) favor a Democratic proposal to reopen parts of the federal government that do not involve border security while negotiating funding for the Wall. Press 1, to vote for the Wall. Meanwhile, independent journalist Laura Loomer exposed “no border wall” Demonrat House Speaker Nancy Pelosi’s utter hypocrisy. 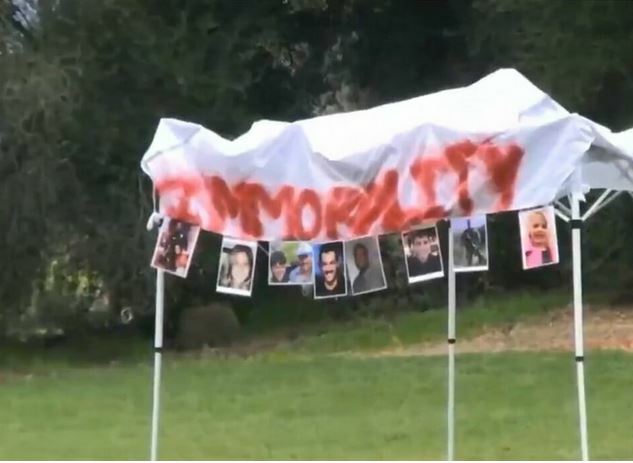 Gateway Pundit reports that yesterday, Loomer brought a group of illegal immigrants from Guatemala and Mexico to Pelosi’s mansion in Napa Valley, CA, and set up a “sanctuary camp” on the lawn, with photos of Americans — including Kate Steinle — who were killed by illegal aliens. Police were called, and evicted, i.e., deported, the group of illegals. See also “Nancy Pelosi’s San Francisco home has a border wall”. Tonight, at 9 p.m. EST, President Trump will speak to America about security along our border with Mexico. Trump will follow his speech with a visit to the border on Thursday. Vice President Pence said the national address is due to congressional Demonrats’ refusal to even negotiate on funds for border wall construction, which would end the partial (25%) federal government shut-down that began December 22. President Trump asks for $5.7 billion for construction of a steel border wall. 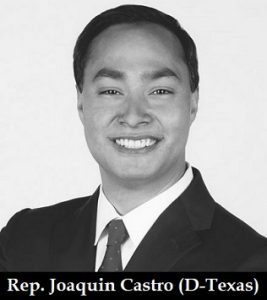 Note that the first order of business of the House Democrats was to pass bills to fund hundreds of millions of dollars for abortion by Planned Parenthood ($100 million), international NGOs ($500 million), and the UN Population Fund ($37.5 million). A vast majority (86%) of Americans say illegal immigration is a problem, including 97% of Republicans, 82% of independents, and 83% of Democrats. Only 7% of Americans think illegal immigration is “not a problem”, including 2% of Republicans, 7% of independents, and 12% of Democrats. The remaining 6% of Americans are not sure if illegal immigration is a problem or not. 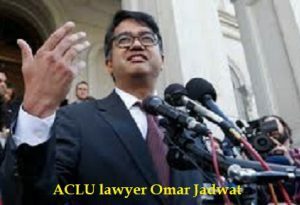 In fiscal 2017, as many as 3,755 known or suspected terrorists entered the U.S.
Customs and Border Protection agents caught 17,000 adults who had criminal records. Immigration and Customs Enforcement apprehended 6,000 members of gangs, including the violent MS-13. A 73% increase in fentanyl, one of the deadliest drugs, totaling 2,400 pounds. A 38% increase in methamphetamine. A 38% increase in heroin. 50 migrants a day required medical treatment. And when/if President Trump declares border security is a national emergency, the U.S. Army will be the primary contractor to build the wall. InfoWars reports that two days ago, on Sunday, January 6, the White House Office of Management and Budget (OMB) sent a letter to Democratic House committee chairs, informing them that the Customs and Border Protection agency is coordinating with the army to fulfill President Trump’s goal of securing the border with a steel wall. On Sunday, Tijuana residents waved Mexican flags, sang the Mexican national anthem and chanted “Out! Out!” in front of a statue of the Aztec ruler Cuauhtemoc, 1 mile (1.6 kilometers) from the U.S. border. 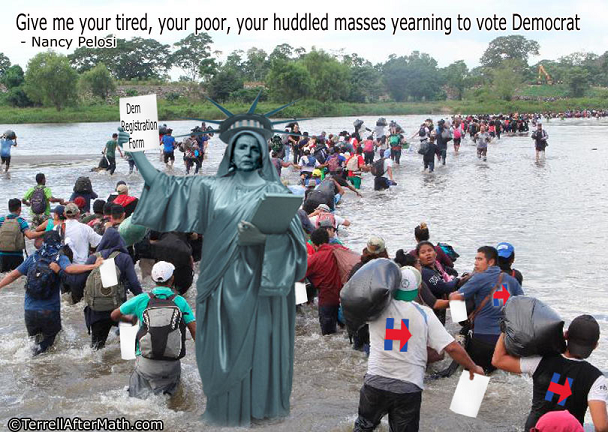 They called the migrants messy, ungrateful, “a danger” to their city, and an “invasion”, and voiced worries that their taxes might be spent to care for the invaders. 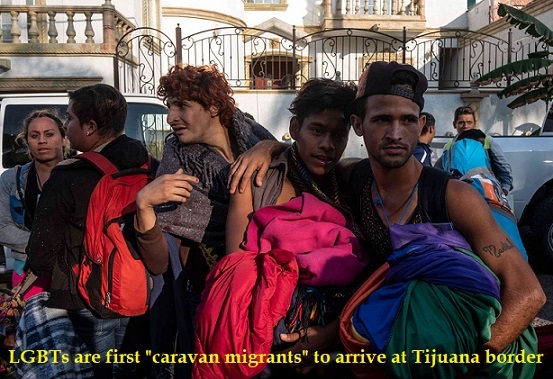 In the past week, Tijuana officials have arrested three dozen “caravan” members for drug possession, public intoxication, disturbing the peace and resisting police, and said they would be deported to their home countries. 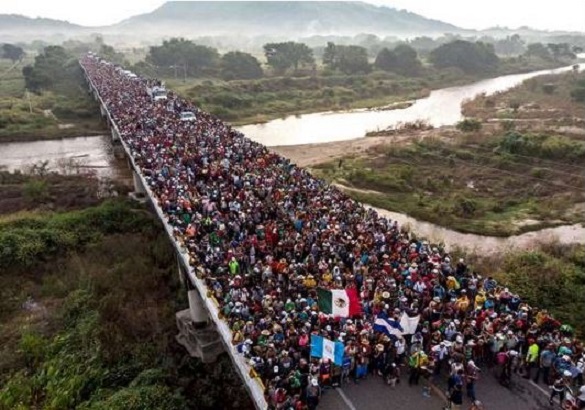 (5) On November 8, 2018, invoking the President’s national security powers to protect the United States against threats from abroad, the Trump administration announced new immigration rules giving President Trump new authority to deny asylum to “migrants” who illegally cross the border. No one could apply for asylum except at an official border entry point. In 2015, in a first-of-its-kind ruling for the state of California, Tigar ruled that the state must pay for an inmate’s gender realignment surgery because denying “her” that surgery violates “her” constitutional rights. 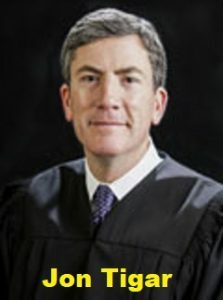 Indeed, the Military Times reports that on Tuesday, November 20, White House Chief of Staff John Kelly signed a “Cabinet order” expanding the authority of troops at the border to include “a show or use of force (including lethal force, where necessary), crowd control, temporary detention, and cursory search” in order to protect border agents. 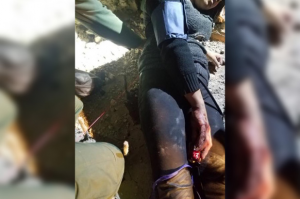 On Wednesday, November 21, Defense Secretary Jim Mattis said that the White House had given him explicit authority to use military troops to protect Customs and Border Protection personnel at the southwest border, with lethal force if necessary. But he was adamant the military would remain within its legal limits. Generally, U.S. troops are authorized to use force in self-defense. Americans already distrust the mainstream media (MSM). A January 16, 2018 Gallup Poll found that distrust of the news media has soared in recent decades, from 25% of U.S. adults in 1989 to 45% today saying there was a great deal of political bias in news coverage. 66% of Americans say that news media “do not do a good job” of “separating fact from opinion” (86% of Republicans; 44% of Democrats). Did you know that a study by Indiana University professors Lars Willnat and David H. Weaver found that in 2013, only 7.1% of full-time U.S. journalists identified themselves as Republicans? In fact, the percentage of Republican journalists continues to decline — from 25.7% in 1971, to 18.8% in 1982, to 16.4% in 1992, to 7.1% by 2013. No doubt the percentage is even less than 7.1% in 2018. 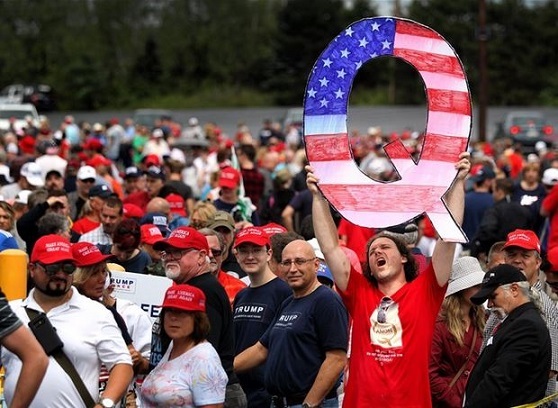 With the lawful election of Donald Trump to the presidency, the MSM have gone insane with vitriol and hate, showing that they really are the Hate America Media (HAM). 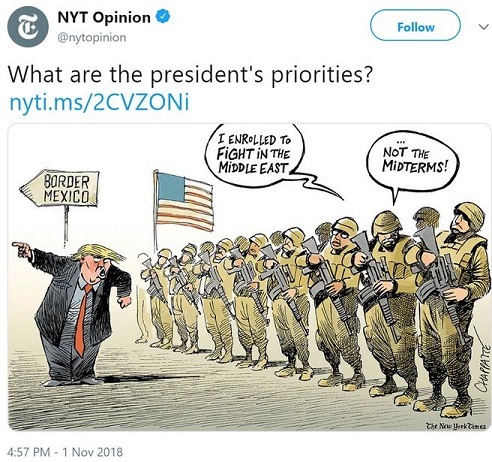 Here’s an example: a cartoon by New York Times editorial cartoonist Patrick Chappette, portraying U.S. soldiers’ mission as that of fighting Israel’s wars in the Middle East, and the soldiers refusing to defend America’s southern border against the impending invasion of thousands of “caravan migrants”. No longer covert and sneaky, the Hate America Media have abandoned all pretenses at journalistic objectivity. An example of the HAM’s declaration of open warfare against Trump and his millions of “deplorable” supporters is the editorial board of the New York Times urging Democrats to go to war against a sitting President of the United States by deploying violent and unscrupulous “Godfather” mafia tactics. Now, the American people are fighting back against the Hate America Media with open hostility, threats, and even physical attacks. The June 28 shooting at the Capital Gazette in Annapolis, Maryland, where five people were killed. In October, an intruder was shot after kicking down glass doors at Fox’s local station in Washington, DC. In Dallas, Texas, a man purposely crashed a pick-up truck into the side of a TV station. In Miami, a reporter and a photographer were physically attacked while doing a live shot. In North Carolina, a news crew had its power cable cut while covering a demonstration. CNN correspondent Jim Acosta — who is barred from the White House for being rude, combative, and assaulting a White House intern by putting his hand on her arm to stop her from doing her job — has been the target of chants and epithets when covering Trump rallies, including one recently where a man looked at him and made a motion like he was slitting a throat. Caitlin Penna, a freelance photographer from Durham, N.C., said she constantly has her guard up on assignments. 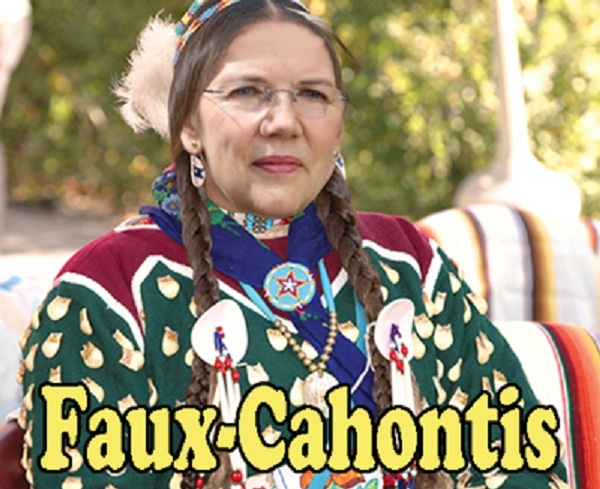 Even her conservative family is suspicious of her. “I’m pretty sure my grandmother thinks I’m this far-left liberal because of the things I cover,” she said. One night she was unwinding at a local bar and struck up a conversation with a man nearby. When she discussed what she did, the man said, “you report fake news” and walked away. Some journalists are quitting because of the hostility. The hostility she’s felt from the public recently was one of the reasons why Los Angeles KNBC-TV news photographer Lori Bentley-Law decided to quit the business after 24 years.